North Korean TV footage of an arms and munitions industry conference appears to show the country's former leader Kim Jong-il inspecting one of the country's first ever atomic bombs. 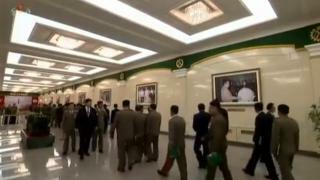 A 30-minute bulletin showing the 12 December conference in the capital Pyongyang has North Korea watchers agog at the picture's appearance in the conference hall. The photograph, never before seen in the West, is visible for only a few seconds as the camera sets the scene for the industry conference, attended by Supreme Leader Kim Jong-un, the son of the late Kim Jong-il. It hangs among others showing North Korea's "achievements" in arms production, alongside scale models of ballistic missiles. Because of its fleeting appearance from a distance, experts are holding fire on a positive identification of the device as an atomic weapon. But the photograph has notable similarities to recent photographs of Kim Jong-un inspecting the country's first (claimed) hydrogen bomb. The picture on the wall appears to show Kim Jong-il, who died six years ago this week, inspecting some sort of large globe while in the company of senior officials. There are no publicly available images of the late Kim, known in his homeland as the "Shining Star", looking at a nuclear weapon, but some photo manipulation suggests this could be the case in this instance. It was first spotted by China-based Twitter user @xutianran on 12 December, who asked: "Is this an A-bomb or sth [something]? ", a question which had fellow North Korea watchers trying to make a positive identification. US arms control expert Jeffrey Lewis simply tweeted: "This is the photo we're all ogling." If it is a genuine picture of the late Mr Kim, then it would possibly be dated either 2006 or 2009, when North Korea carried out nuclear tests. There is the possibility the globe is a mock-up, as there are no records of a scientist being able to miniaturise a nuclear device at that time. However, this is not the first time North Korea has "accidentally" given away surprising information in the background of news reports. In August, the country revealed plans for previously unknown ballistic missile types when they were spotted on wall charts during coverage of a visit by Kim Jong-un to a defence facility. Previous arms and munitions conferences have been decidedly low-key, but this year's event was marked as a triumph on state-run television following recent successful ballistic missile tests. News of the conference was presented by Ri Chun-hee, the senior news reader who has become renowned for announcing all of the country's recent missile launches. She said North Korea's military-first policies had succeeded in the face of United Nations sanctions. The footage includes a full minute-and-a-half of standing ovation and (possibly dubbed-on) cheering for Kim Jong-un from a packed hall of delegates. The word "victory" is repeatedly extensively throughout the bulletin, and the nuclear weapon and missile projects are presented as part of a continuing and ultimately triumphant battle against North Korea's enemies. In his closing remarks, Kim Jong-un calls for further development of nuclear weapons and missile technology. The country, he said should, "bolster up the nuclear force in quality and quantity, manufacture more [of the] latest weapons and equipment of Korean style". This week's conference sees a continuation of Kim Jong-un's "victory lap" of missile facilities. Last week, he visited a factory that provided tyres for the latest missile's giant launcher. However, despite Mr Kim making hay with the success of the weapons programme, state news agency KCNA recently let slip that crops have been affected by drought this year. Some analysts think that his official declaration of "victory" could lead to a greater emphasis on food production in the coming years. North Korea crisis: What does Kim Jong-un really want?